What happens when atheists claim the new kind of “religious freedom”? Ever since the Tea Party sweep of 2010, conservative Christians have been on offense in state legislatures, pushing a variety of laws that distort religious freedom — a fine principle that goes back to the foundation of our country — into something the Founders would not recognize at all: the power (not freedom) to shape society so that it doesn’t rub Christians the wrong way. The hole in this “religious freedom” rhetoric is that in practice only Christians (and only certain kinds of them) can wield such power. The people who push these laws are shocked whenever someone wants to extend the same kind of consideration to, say, Muslims or atheists. (Muslims, after all, can’t even take for granted the original meaning of religious freedom, which included the ability to build a house of worship.) Justice Alito’s majority opinion in the Hobby Lobby case more-or-less just laughed off the idea that employers with less mainstream religious views — Christian Scientists, say, who reject virtually all modern medicine — might claim the right to control their employees’ health insurance too. In recent months progressives have been playing whack-a-mole with anti-gay “religious freedom” laws in various states, threatening boycotts and mostly succeeding in avoiding the worst. But the way the new “religious freedom” will ultimately be brought down is to force courts to consider its laws in the light of the 14th Amendment’s guarantee of “equal protection under the law”. If “religious freedom” laws end up giving atheists and Muslims the same consideration Christians are claiming, Christians will repeal those laws themselves. In other words, non-Christians need to insist — in court — that society shouldn’t rub them the wrong way either. There will often be an aspect of the ridiculous in these cases, like the statue Satanists want to install on the grounds of the Oklahoma statehouse, now that religious statues are allowed. Newdow has failed to banish “in God we trust” before, but this time he’s basing his argument not just on the Establishment Clause of the First Amendment, but on Justice Alito’s interpretation of the Religious Freedom Restoration Act. Government may burden a person’s exercise of religion only if it demonstrates that application of the burden to the person — (1) furthers a compelling governmental interest; and (2) is the least restrictive means of furthering that compelling governmental interest. The Hobby Lobby decision put forward a very expansive notion of what it means to “burden a person’s exercise of religion”. It used to just mean things like forcing Jews to work on Saturday or lose their jobs. But the Hobby Lobby decision extended it to forcing a corporation to fund health insurance that its employees might choose to use in ways that the offend the corporate owners. forgoing the convenience of using the public currency. And since putting “In God we trust” on the currency accomplishes no useful purpose whatsoever, this burden does not further any compelling governmental interest. In case anybody out there wants to volunteer, Newdow is seeking plaintiffs from legal jurisdictions where no existing ruling supports “In God we trust”, especially Alabama, Florida, Georgia, Maine, Massachusetts, New Hampshire, Puerto Rico, and Rhode Island. The time commitment will be minimal (as you help write the prose relevant to your particular circumstances) and there will be no obligation to provide any financial contribution … What we need mostly are families with minor children since the Supreme Court has indicated that it is more likely to uphold constitutional (and, presumably, statutory) principles when children are involved. Please be advised that the identities of any families with children will be kept “under seal” in order to protect the children from any harms. I don’t have children, and my published opinions on God are sufficiently ambiguous that I’d make a lousy plaintiff anyway. But I’m sure there are Sift readers out there who are just perfect for the job. One of my friends was a plaintiff in one of the important religious-freedom cases of the 1960s (when religious freedom still had its original meaning). His family’s experience was more difficult than what Newdow pictures (because their name was public) but half a century later, I think he still looks back on it with pride. Doesn’t it truly ruin your day when you realize you have built the Trojan horse that will eventually be your own demise? 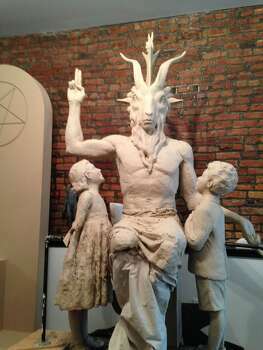 I do not know if there are any better methods available to oppose religious creep than, for instance, the Oklahoma Satanic Church statue example. It has long been my opinion that each and every time any established religious icon (like a Ten Commandments supposed replica) is affixed to a publicly funded wall or placed anywhere else on government property, the most bestest swift response is to craft items representative of as many different religious traditions ever extant in the US, whether indigenous or brought along by immigrants, and place all those as closely adjacent to initial non-secular item as possible. Letters to the editor, appearances at school boards and city councils, & protestor’s with signs are ignored, delayed, and often swept aside by motivated community majorities; when courts side with the one or few who protest, it is after lengthy and often financially costly processes that, while victorious, may change few minds and reinforce religious anti-secular zealotry in far many more people. Forced to confront physical symbols defines display controversy in a way which focuses a lens on privilege vs rights, as well as the scope of rights and the potential blowback from pursuing privilege for a specific religious adherence over all others. The theocrat is left with little wriggle room when he/she attempt to weasel around with Establishment interpretation, and either come right out in the open with their goals or retreat into their dark place to lick their wounds while they figure out their next move. It’s telling that I’m not seeing the “religious freedom” advocates speaking up to defend Muslims taxi drivers who refuse to transport guide dogs. I didn’t know there were any of those. Why?